Extend. Retract. Tilt. Swivel. Swirl. Moving in smooth, effortless movement that is fluid. There are television mounts for every lifestyle and budget for homes, offices and stops. We can help you with every step of the installation — even picking out the TV! redbpower Company, offers sound, video, and electrical solutions throughout the Georgia and South Carolina low country, offers an array of installation services from mounting televisions, to integrating speakers, to relocating electrical outlets our installers can help you through every step of the way. We can even help you pick out the best television system! Our technicians can be reached at the redbpower line: 912.871.7332. Our service area, licenses, and certifications include Georgia and South Carolina. BXP156903, originally uploaded by lucas_muffy. Thanksgiving is a time for food, family, rest and relaxation. Is there a better way to unwind than a lazy day or night filled with fabulous, festive features to get in the spirit of the season? Grab your family, y’all. Let’s gather ’round and catch a flicker! Thanksgiving provides lots of fodder for drama — from family conflicts to romance to dining disasters. There are light, feel-good ones to chaotic family dram. The Silver Screen is full of Thanksgiving talkie. Home for the Holidays. Classic family dysfunction is played out with a sense of humor over the Thanksgiving holiday. The cast includes Robert Downey Jr., Anne Bancroft, Holly Hunter and Dylan McDermott. Scent of a Woman. Ahh, you an Al Pacino fan? Or crazy about Chris O’Donnell? This is one of the best family Thanksgiving pics for you! It’s about a young student that changes the life of a blind, medically retired army officer and how he saves his life and how that same officer changes the life of this student for the better — and how he finds the woman who loves him truly. Funny People. Brian is an Adam Sandler fan. Okay, HUGE one. This movie is Adam’s Turkey-Day toast! At the very least it will make you laugh. Planes Trains and Automobiles. Speaking of funny, Thanksgiving doesn’t get more hilarious. John Candy and Steve Martin on a cross-country Thanksgiving journey provide enough barreled-over laughter that you can count watching this movie in your workout schedule! Miracle on 34th Street. Though it usually gets billed as a Christmas movie, this classic begins on Thanksgiving Day. It is gauranteed to make you thankful you watched it. Pieces of April. Remember Katie Holmes before Tom Cruise? No? Well, me either. You can see her back in the day in this film in which she stars as the family black sheep. The story centers around a Thanksgiving reunion with her estranged family, including her cancer sick mom. Winnie the Pooh — Seasons of Giving. So if, A Charlie Brown Thanksgiving isn’t for you but you are looking for a family-friendly movie, Pooh and friends delivers. It’s a sweet story about family and friends and the true meaning of the season. It’s straight from the Hundred Acre Woods. Hannah and Her Sisters. Here’s a classic starring Woody Allen and Mia Farrow, it begins and ends with Thanksgiving dinners. In between it’s a sweet, deep, and somewhat dark look at familial relationships – total WA style. These are just a few that we can think of off the top of our head. There are so many more Turkey Day cinematicss to put on the living room box eye. Do you have a favorite? Can you think of anothers to list? Tell us. We want to share! May you be blessed with lots of blessings, grace, gobble-gobble and good home movies! It is amazing! One button starts the morning coffee, bath lights, and local news. What else could anyone ask for?? Smart homes are awesome and installing it is, too! Where do I put the speakers? There are a lot of factors. One important thing to remember is that when setting up your speakers the room plays a key role in the system sound quality. Your room’s shape, layout, and where the speakers are placed are all factors that will affect performance. Placing your front speakers next to a wall will slightly increase their bass output. This can improve the sound of smaller, bass-shy satellite speakers, but can muddy the sound of floor-standing speakers. Conversely, bringing speakers out from the wall may lessen their bass response but improve clarity. A room with too many reflective surfaces, like windows or tile, can add harshness to the sound that makes it too bright. Adding carpet, rugs, or curtains can help your system sound more natural. Unfortunately, there lots of variables in your room to be able to account for them all. But you are in luck, most newer receivers come with automatic calibration. How in the world does calibration work? Well, it uses a microphone to record and measure test tones played through the speakers. The time it takes for the sound to reach the microphone, along with the strength of the sound and other factors, tells your receiver what kind of speakers you have, their placement in relation to your listening position, and how the sound they produce reacts in your particular room. The receiver can then make adjustments to ensure that you get the best sound in your room. I hope this helps get you started with your home theater. You can calibrate and install yourself, or use a professional. 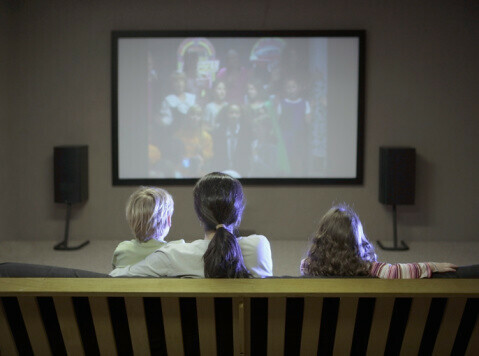 One reason we have a low voltage license is for home theater. We love it! If you try it yourself and have questions call us, 912.871.7332. Or, if you don’t even want to bother with doing it yourself – let us take care of the hassel. We will have your speakerboxes in top sound for the shape of your room! If you’re looking to put some spook in your speakers for your Halloween bizarre, here it is! A list of creepy music. Drop this eerie list in your surround sound. Put a scary movie on the home theater and let the spine chilling begin. and, ANY SONG from the Rocky Horror Picture Show, of course. Can you think of any other Halloween Music? Maybe a Psycho track? 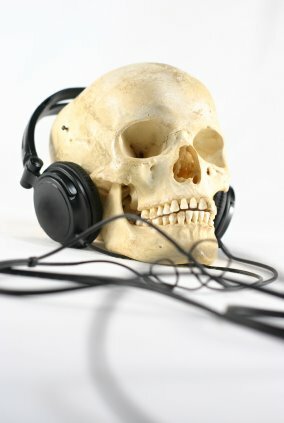 What do you like to thump through your dolby’s to get you in a frightful mood? Thanks to Crafty Suzanne for the playlist and photo. Here’s a great Hanging Lantern Ghost if you want another Halloween Project. 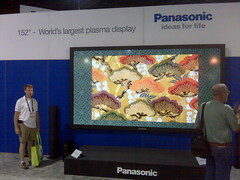 Home Theater Magazine attended the same show that we went to (2010 CEDIA Expo) a few weeks ago. In fact, they posted a great show report. There was so much information at the event that it is difficult to break down and share, which is why we haven’t done a very good job. Despite the difficulty, Darryl Wilkinson from Home Theater Magazine wrote this great article about Wi-fi that vended at the show. If you’re having trouble with routers and multiple access points in your home Wi-Fi network (as I am), Luxul Wireless says they have a solution for you with the company’s whole-home Wi-Fi network installation products. Luxul’s Pro-WAV products can increase the coverage area of 802.11b/g Wi-Fi gear by an astounding 400 percent; and Luxul says they can provide coverage for 10,000 square feet of home (or more) with a single access point. That means you’ll have seamless roaming of iPods/iPads, fewer wireless access points, and expanded usage of Wi-Fi throughout the home – all from products that can be mounted in a closet or attic. And, another CEDIA Show winner is Leon Speakers who had the Baddest Audio Demo, check it out!